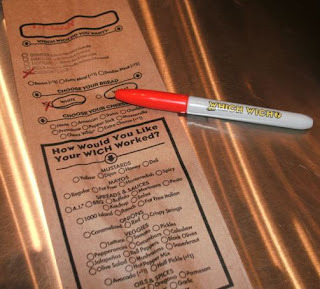 We Are The World: Which Wich? I might be way behind the times, but I just discovered a fun sandwich shop. Not just a fun sandwich shop, a superior sandwich shop. You walk in and go to a stand for the general type of sandwich you crave. Like "Italian" or "Turkey" or "Vegetarian," "Seafood," "Classics," or "Comfort." 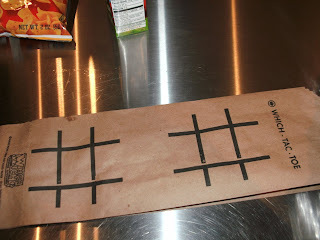 Whereupon you select a bag and a Which Wich Sharpie marker. The bag, as you can see, has many selections for you to personalize your sandwich, the options are almost endless. Should you desire, you can flip your bag over and play tic, tac, toe while you wait for your family and friends to complete their orders. 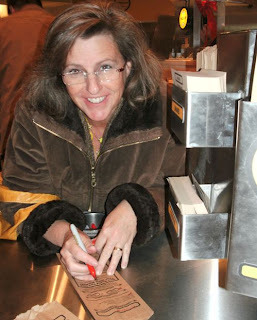 Then, my favorite part, you write your name at the bottom of the bag. It's the honor system! They take your word for it! I, of course, wrote "Nicole" because I was feeling like a Nicole that night. See? Don't I look Nicole-ish? Later... when they called our names to pick up the food... the rest of my family had written their real names except Marj, who was going by the name "Mary." I thought she was feeling like a Mary, I didn't think she was acting like a Mary, but she said everyone mis-reads her name anyway, so she made it easy. The food is certainly fresh and the options are plenty, amazing really. The experience is fun. But the price is a little bit high, I think all Wiches are $5.50. Some stores offer online ordering, which would be nice in an office rush-hour scenario. OK. My faorite part? I lied. 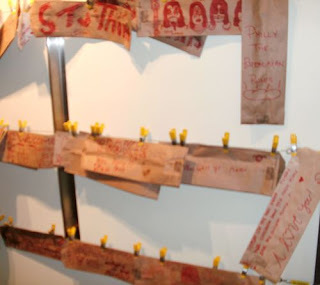 The Best Part is a little back corner I found at my local Which Wich where you could use your Sharpie to decorate your bag and hang it up for display. See mine? Probably not -- it's in the middle of the photo, in a glare, with "Pookie" at the top that looks like "Pooker." What a cute idea you've got to take Pa and me there!